I love that I get to introduce you to Alexa's Angels! This fun online jewelry shop that specializes in unique and meaningful gifts for you and your loved ones. I was honored to receive not one but two Crystal Heart Bracelets in the color pink. One for myself and one to just give as a gift to whoever I wanted! I was really impressed with Alexa's Angels for doing that because most sponsors just send samples or just something for the reviewer. It was fun getting to share! The bracelet arrived really quickly and came in really cute packaging (which, in my haste to open the mail, I forgot to show you!). The bracelet has a nice weight to it and is made with really nice, strong Rhodium beads. The heart is made with Swarovski crystals impeded in the metal. It is also versatile in the sense that there are two size options as they put two really fun rings at the end of one side so for my larger-than-the-average-lady wrist can wear it without being strangled. You can also have some fun at Alexa's Angels by sending free virtual Angel Grams to your friends! 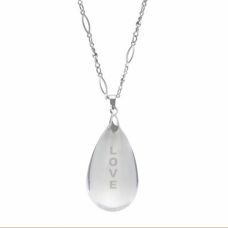 All the jewelry and items created at Alexa's Angels are meant to inspire you and are created out of the love and inspiration creator, Beth Lang, sees in the people around her daily. Alexa's Angels is named after he eldest daughter. As always I love promoting businesses that serve a cause and Alexa's Angels currently supports seven organizations which you can read about HERE. One lucky reader is going to win the exact same Crystal Heart Bracelet that I received, a $20 value! -Tell me about something else you found at Alexa's Angels that you'd put on your wish list! OPEN to the USA ONLY! All opinions expressed herein are entirely my own; I was not compensated for them. I did receive an item to review for free but it in no way affected my honest review. I absolutely love that bracelet so thanks for the giveaway! I just liked Alexas Angels on Facebook as sassydeafdiva and left a comment. I am following you on twitter as sassydeafdiva. I just liked you on Facebook as sassydeafdiva. I am following you via NetworkedBlogs. I like Alexa's Angels and I left a note! Thanks for the great vie away! I'm following you with networked blogs! I'm also in love with the "mother" bracelet (in the language section). I like the angel wing necklaces - so cute! I am an Alexa's Angel Facebook fan and posed on their wall you sent me. Public follower of your blog on GFC. Became an Alexa's Angel Facebook fan and left a note on their wall saying, "Girly Girl Giveaways sent me! 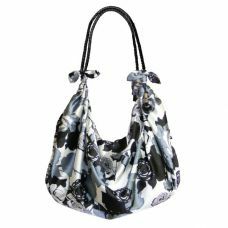 I follow Girly Girl Giveaways publicly via Google Friend as nightowl. I also like the Silk Cord/Multi Small Pearl Sterling Silver Necklace. I like Alexa's Angels on facebook and wrote on their wall. 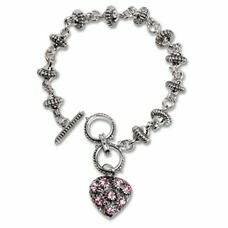 I love the Someone To Watch Over Me Bracelet - Pink.